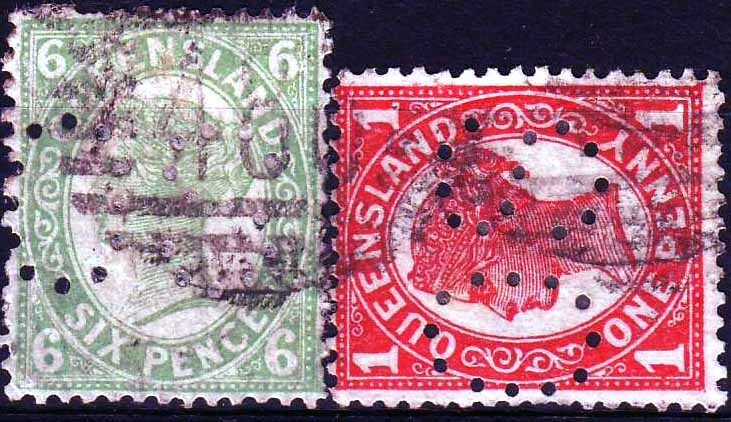 Following a lengthy discussion with a fellow collector of Queensland in early December 2005 regarding the Qld Commonwealth [provisional] OS perfin [13 hole S], I was prompted to hunt once more through my Qld material. My initial reply to my friend was that I had not had one copy, however buried deep in my Aladdin’s Cave I came across a packet marked [of course] 'Qld Commonwealth OS Perfins. This packet yielded some information I thought I should share. According to Anon  and Sheppard  the Commonwealth OS was introduced on 7th August 1905 unfortunately I have not seen these articles and do not know where they gained this information but the first copy to come out of my packet was dated 27th June 05 [fig 1]. I am aware this OS has been reported as being used only in Commonwealth Departments with the majority [98%] of reported copies from Petrie Terrace [numeral 486]. I am unaware of any other recorded post offices. 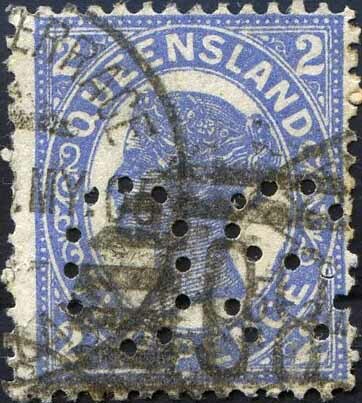 The second stamp to come out of my packet carries a 120 [fig 2] sunburst cancel of Cambooya a town not 12 miles from Toowoomba with the post office located at the railway station, I cannot find any Commonwealth Departments registered in Cambooya, so this stamp can be put down to is getting a receiving cancel on unfranked mail. The third item to come out of my packet was a strip of 3 x 2d [fig 3] followed by 6 pairs [fig 4], [4 x 2d & 2 x 1d] this now allows us to understand whether the perfin was struck in a single operation, in pairs, or in a horizontal row of 10. Measuring the distance between the OS on the strip of 3, left to right they are 6 mm & 3 mm apart. 5 of the pairs are 3 mm apart and one pair 4 mm apart. All are in perfect alignment except for one pair In conclusion with the finding of this strip of 3 the perfin must have been struck in pairs. It is recorded by early students this smaller size OS [fig 5] took over in October 1905 and ran till 1912, making the use of the first larger OS [extra pins, figs 1-4] and taking into account my early date, this leaves just four months usage. A further bonus in the packet was a 4d yellow. 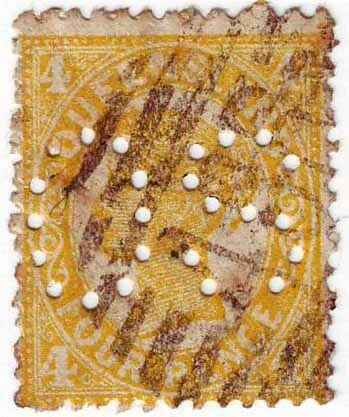 Collas wrote about these in the Australian States Study Group of the Royal Philatelic Society of London newsletter in February and September 1975.